With the airports everywhere introducing the luggage fees, and with some of them being very high, you might want to check the weight of your luggage yourself. But, however, can you do that? The answer is simple – luggage weight scales. 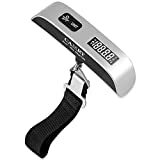 Luggage weight scales are small devices that accurately weigh your bags. This way you’ll know the weight of your luggage going in, and you can either reduce the load or prepare to go in knowing exactly how much they’re going to charge you. In any case, whether you’re a regular traveler or an occasional one, you will most definitively benefit from this and simple device. In fact, here are 5 of the best ones around. 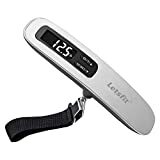 Next on our list is the Tarriss Jetsetter Digital Luggage Scale. This excellent little scale is very sleek and stylish but very accurate and very strong. The scale can take on a maximum of 110 pounds, and has a measuring accuracy of about 0.2 pounds, making it one of the most accurate ones. The Tarriss is twice the price of SmarterLife Products’ scale, but can hold twice as much maximum weight. The model features a very long lasting lithium battery and features auto shutoff so that it is as energy effective as possible. Our last item is also the most interesting one. The EatSmart digital luggage scale is a very innovatively designed product, as it resembles a handle. 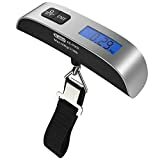 In the face of other scales in this list, this one offers a greater level of comfort when using it, because it’s easier to hold it up with the luggage attached, and you can even use it as an extra handle. When it comes to performances, the device performs just as well as the others. It has a maximum capacity of 110 pounds, but is slightly more precise, measuring with excellent accuracy, with a possibility of a mistake of 0.1 pounds. Some of the best products are also the most affordable, and SmarterLife Products’ digital scale is the definition of affordability. The scale costs only about $7 off Amazon, but it’s packed with many features and is one of the simplest devices on the market. But one of the best qualities of the scale is because it’s so small. It is literally small enough to fit into your pocket, making it super portable. Whenever you need to check the weight of your luggage, you just pull it out, attach your bag or suitcase onto the hook, and you’re ready to go. 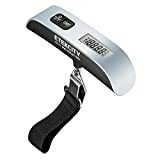 The device features a neat digital display, and is very accurate, complete with an audible alert that the weight is locked in. The only bad thing is that it takes it a while to lock it in. Another great product is the Spigen E500 Luggage Scale. This little scale is very similar to Tarriss, both in performances and in design. Small and compact, the device is small enough for your pocket and can be whipped out whenever you need it. Just like the Tarriss, the Spigen can take on a maximum of 110 pounds. This is enabled by its sturdy stainless steel hook. The device is incredibly accurate, as accurate as Tarriss, measuring with an accuracy of 0.2 pounds. The entire thing costs about 10 dollars off Amazon. Our penultimate product is yet another superb little scale and an affordable one too. 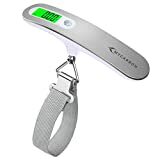 The Accuoz Digital Luggage Scale is quite the charmer, what with its nice, fashionable design and compactness. Accouz Digital is a very precise device, and it measures with a mistake of only 0.2 pounds. This ensures exact measurement, so you can’t go wrong and risk getting charged exorbitant prices. The device has a maximum load capacity of 110 pounds, just like the rest, and costs about 10 dollars of Amazon, like the Spigen. And there you have it, five awesome digital luggage scales. Armed with such a small and simple device, you will never be charged as much as $500 at an airport because your luggage is overweight. Be smart and be prepared, get yourself a luggage scale.